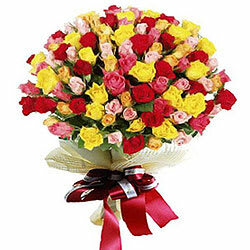 Gift this Striking Bouquet of Premium Multicoloured Roses to keep your beloved smiling and happy. This Bright Floral arrangement holds 50 Mixed Roses. Make occassions grander with this Multicoloured Bouquet of 75 Premium Mixed Roses and share the moment with your loved ones.